SEATTLE -- Local researchers have now proven that bird flu has finally mutated and can be transmitted from person to person. The outbreak occurred in 2006 in Indonesia. Experts at Fred Hutchinson Cancer Research center in Seattle used statistical analysis and a computerized disease-transmission model to show the disease spread between a small number of people in one family. The chain of infection involved a 10-year-old boy who likely caught the virus from his 37-year-old aunt who had been exposed to dead poultry and chicken feces. Researchers say the boy then probably passed the virus to his father. All but one of the flu victims died. All of those who contracted the disease had long, close contact with other ill family members prior to getting sick. Health authorities eventually placed more than 50 surviving relatives and close contacts under quarantine in an attempt to contain the spread. One of the authors of the study says that containment came late, so it was lucky the virus didn't spread any further. "It went two generations and then just stopped, but it could have gotten out of control," said biostatistician Ira Longini, co-author of the study. "The world really may have dodged a bullet with that one, and the next time we might not be so lucky." Longini says that if bird flu develops enough to cause sustained human-to-human contact, it could spread worldwide faster before enough vaccine could be made available. The researchers estimate the rate of one infected person passing bird flu to another in Indonesia is 29 percent. That's similar to the spread of seasonal flu in the United States. Researchers also say another bird flu case in eastern Turkey in 2006 that killed four people was probably spread person-to-person, but there wasn't enough statistical data to support the theory. The study will be published Sept. 1 in Emerging Infectious Diseases, a journal of the Centers for Disease Control and Prevention. Mountain House freeze dried food is the best emergency storage and camping food in the world, bar none. In #10 cans, it lasts 30 years. It's been more than six years since Mountain House has raised their prices, but their rising costs have become too much to hold the line any longer. As of September 1, they are raising their canned food prices. It's not too late to take advantage of this last opportunity at 20th-century era pricing on premium storage food. Note that it is real, delicious entree food that Americans love to eat ... NOT beans or hard wheat, etc. Take action and stock up! ... Panic is something that spreads. It begins in one place and moves outward, in every direction. "There is no fence against a panic fright," wrote Thomas Fuller in 1732. When the herd fall prey to a pack of wolves, the herd begins to panic. Who will stop the panic? The government is expected to stop it. The government must do something. But the government is part of the herd. It shares the herd’s mentality. So who will save the government? "Towards Eco-Affluence: The Meaning of the 21st Century"
Read the full article by Jurgen Reinhoudt. Intro: It takes ambition (at a minimum) to write a book titled "The Meaning of the 21st century." James Martin, a graduate of Oxford who made a fortune in the computer industry, has done an admirable job in this endeavor: after talking with a diverse group of leaders and thinkers such as Hernando de Soto, Rudy Giuliani, John McCain, Gordon Moore [of Intel fame and Moore's law], and others, he put his own thoughts on paper, outlining the challenges facing humanity in the next 100 years. There are many things about me that (hopefully) remain closely held, even after years online ... blogging and participating in several discussion forums, etc. One, I'm the son of a preacher. (That may or not be a surprise.) My dad, now in glory, had more than his share of troubles with me, as I took a long time growing up. Nonetheless, I think his work and faith in me eventually paid off. In fact, I've got a few drops of the preaching blood in me, as evidenced by my periodic "sermons" anywhere folks will pay attention. Two, moderation in everything--to include in preparedness--is a big issue with me. Why? Because in my life, I've been addicted to more things than I care to admit. I went through inpatient and outpatient treatments and I worked the 12-step program for different problems. Sadly, I let down a lot of people in my younger years. I still take one day at a time and thank God for each one. Thankfully, my head has been on straight for more than 20 years now, and I have been blessed to be able to give back in some measure to my loved ones and my community. Those little revelations are just a bit of background to this latest exhortation (hell-fire and damnation, if you will) for folks to do common-sense preparing for crisis and disaster ... but to not go too fast or get too locked in on the headlines, causing you to go overboard. Like a lot of lifestyle choices out there, it happens too often where folks all at once go headlong into it, getting into financial difficulties because of drastic purchases they make to try to suddenly get squared away ... or destroying personal relationships or careers or making huge life-decisions on the basis of becoming suddenly scared about some scenario they read about on the internet. Let's face it--there's a whole separate reality online where the end of the world is imminent. If you hang out long enough online, it's not that hard to get sucked in. It happens. Extreme prepper syndrome (my lame term) happens more often than it should. Experts would not likely call survive-a-holics (again, lame) addicts in the medical sense, but compulsive behavior like this that blocks out the rest of a previously healthy outlook on life can certainly manifest itself in those who are vulnerable. I know A LOT of folks who need to chill just a bit ... to take in the whole panorama of daily life, and for most of us, to accept and appreciate that life today is pretty good. We are not only fine today, but the odds are overwhelming that the future is going to work itself out for most of us as well. That said, I also clearly admit that we don't know for sure what tomorrow will bring, so yes, I always promote common sense preparations. Do it well, do it systematically within your budget. Take it one step at a time and make sure you fit it into your household's way of life as gradually and gracefully as possible (don't bludgeon your unwilling family with a sudden prophecy of doom--a surefire way to create turmoil under your roof). Why go slow? Because, the last time I looked, we don't yet have the shadow of a comet darkening our world. Nor are Mr. Putin and his comrades seizing western Europe. And H5N1 still is largely an avian threat. As for the ongoing sub-prime financial downturn--stuff happens, but chances are a mixture of systems, processes, governments, banks, and bailouts will as usual, soften the impact on the average American. The crisis preparedness marketplace is a cousin of the insurance industry, distantly related by a common peace-of-mind forebear. We are there for folks to help mitigate some of the risks we all face in an uncertain world. There are never guarantees, but in spite of the ever-present doom-sayers, our world is, all-in-all, a pretty decent and safe place to call home. In a nutshell, don't sweat the little things. So my one always-relevant suggestion is for folks to prepare for danger or setbacks in their life with measures that are not sole-purpose expenditures, that is unless you have more money than you know what to do with and you have no one else to answer to insofar as how you are spending that superfluous cash. Buy emergency storage food that is genuinely edible, that you will eat, and that you will enjoy. Don't buy stuff that you will have to throw away at some point ... and surely don't buy stuff that will you will not use before its shelf-life expires. You always will need food ... buy some of it to store away--stuff that will store well for many years and that you can go and eat and enjoy anytime you need or want to. If you are building a new home or addition and there is some part of you that feels like you ought to have a safe place in your home to go to in the face of threats, then by all means, take advantage of that best-time opportunity to build-in a dual-use safe room or shelter that will protect your family from natural or man-made disasters. Besides making for emergency refuges--shelters and saferooms make for ideal storage spaces and even work-spaces or spare bedrooms. Do you enjoy the great outdoors? Do you hike or camp? Many of those outdoor pursuits make use of equipment that can double as critically needed gear in the event of disaster. Keep that in mind when you make those recreational purchases, as you may just want to adjust your purchasing decision to cover all your needs. How about investing in the means to operate some of the appliances and conveniences in your home in the case of blackout? Most of us have had the experience of having to do without power for some extended period of time, and at least risk losing all the food in our refrigerators. A generator (propane powered or diesel or gas powered) can be had for a very reasonable amount of money. Consider also a professionally installed transfer switch in your home that allows for that generator to safely power at least parts of your home. This makes sense for not only shorter-term power outages, but is a life-saver in longer-term crises. The list goes on and on. More than creating a resource for how to prepare your home for disaster, I wanted to make this about approaching preparedness logically, calmly, not getting too worked up about any particular threat of the hour. Things almost always do work out fine for the vast majority of people. The odds are strong you will live a largely unchallenged, uneventful life, particularly if you live in America. So to get too worked up about any particular possibility for doom is not a productive or enriching use of your energy or resources. If you're into crisis preparedness, you might know someone out there who lives for danger and societal demise. You know the type--they can bury their secret retreat and camoflauge the bug-out vehicle in the backwoods, but they can't disguise the adrenaline habit that arises out of tracking headlines continuously for signs of impending carnage. Of course, weeping and gnashing of teeth sells widely in the media anyway, but there are many info-consumer/bunker rats walking among us who just plain thrive on bad news. Maybe they are invested financially or emotionally in it, maybe it is just a validation of their outlook that the end is near. Either way, or for whatever other reason, imminent potential disaster injects borderline excitement and fear into the week and reinvigorates an impatient existence spent otherwise stocking the larder and stringing barbed wire around the perimeter. Hey--can you tell that I know of what I speak? Yep--I've been there, dug that bunker. Main point: Real survivors know there's a sharp distinction between being a prepper and being a doomer. It is nowhere near as evident as in times of impending disaster. Right now, it's mainly the downturns in the economy that are feeding the monster that demands to be fed negativity. I can say my own monster is pretty well locked away these days in a closet I haven't visited in quite some time. The key to that lock is in being as physically, spiritually, and mentally prepared as you can be. Then embracing the peace of mind that comes with that. Don't let fear manage you. It's counterproductive and could actually kill you in real crisis. Be the rare individual who is equipped to intelligently fight and lead through adversity. In genuine worst-case scenarios, only about 15% keep their wits about themselves--and it's not always the ones who you would suspect. For more on that, click here. More than anything else, I have to marvel at the "wonder" expressed by the creator of the project. "Al Qaeda Cell May Be Loose in U.S., British Plot Hints"
"... intelligence gleaned from last month's British 'doctors plot' of car bombers suggests that a Qaeda cell is on the loose in the American homeland. "E-mail addresses for American individuals were found on the same password-protected e-mail chains used by the United Kingdom plotters to communicate with Qaeda handlers in Europe, a counterterrorism official told The New York Sun yesterday." 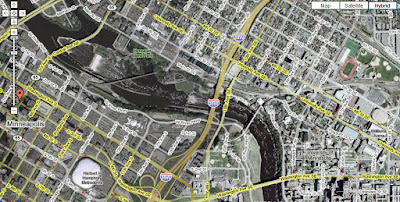 The Minneapolis bridge failure is possibly only an initial tragedy in a series of infrastructure failures yet to come. The knowledge of the need to invest serious taxpayer dollars in the renovation of the aging highway system in the U.S. has been in the public domain for at least 20 years now. But as is the case with so many emerging issues of importance, in America we tend to put things off until there is a jolting realization of imminent crisis before we choose to act. Unfortunately there is no quick fix to the situation now. Even if we decide to throw all the needed money (an estimated $188 billion dollars today) at the bridges already identified as being deficient in the U.S., the reality is that it will take more than a generation to get that needed work done. And of course by then, there will be that many more bridges to repair or rebuild. The Minnesota Department of Transportation is the agency on the hot seat at the moment for not opting to bolt reinforcing steel plates onto the steel girders where inspections had identified fatigue fractures in the 35W bridge that collapsed two days ago and killed at least 5 people. The bridge was identified as being "structurally deficient" but not necessarily unsafe, they say. It is not my style or intent to play the blame game. I fully respect the ability of those MnDot folks to do their jobs. Unfortunately, the department decision-makers will have this tragedy eating away at them for the remainder of their days. In the meantime, we need to pay attention to what this means to us today and in the future. In Minnesota alone, there are 13,026 bridges. They are all subject to regular inspections and as many as 1,042 have been tagged as being "structurally deficient"! That's 8% of the state's bridges. Think you're in better shape if you live elsewhere? Guess again. A whopping 12% of the nation's bridges are "structurally deficient." Think about that next time you are driving over a bridge. As a nation, we are starting to reap what we have sown. We have chosen not to adequately invest in the upkeep of our highway infrastructure. Repairing bridges that look just fine to the untrained eye does not normally qualify as a popular use of our state and federal dollars, so we have dangerously been putting off what we should have been doing for many years already--repairing and rebuilding bridges. So what now? I'm of course in the business of selling people some measure of increased peace of mind. That's what preparedness is about. So I know there is a very strong need out there for confidence in our day-to-day systems and surroundings in America. We want safety in our world. We fully expect it in this great nation. We hate surprises. We especially despise surprises that kill innocent people. In the near future, we will of course be seeing more money invested in highway and bridge maintenance. Probably not nearly enough at this point since this was but one localized incident. Before a genuine public outcry is raised and the politics take on a life of their own, sadly, more bridge failures will need to occur. Bottom line for today--this is not the kind of thing the average citizen can prepare for on his or her own. You CAN carry in your vehicle a first aid kit and one of those small emergency hammers to help you break your vehicle glass from the inside if you find yourself trapped after an accident or underwater. But beyond that, I fear, we are going to have to deal with some growing level of uncertainty about the roads we traverse daily ... probably for the rest of our lives ... since the overwhelming number of potentially dangerous bridges out there are already beyond our ability to rectify in the near-term. For those of you trying to recall exactly where this bridge is that has collapsed--here's an overhead map/satellite hybrid view. Click the image to see it larger. In the last hour or two, reports have saturated the airwaves locally and nationally about the ongoing rush-hour tragedy in Minneapolis. 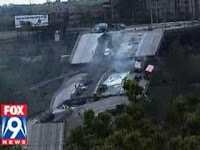 A major thoroughfare for commuters and travelers through the Twin Cities, in direct proximity to the University of Minnesota, has collapsed. Several eyewitness reports on the bridge at the time it collapsed indicate the possibility of explosions that were "blowing" debris and people up in the air before the spans dropped. The bridge was gridlocked with traffic due to construction taking place on the bridge. Homeland Security and the FBI are on the scene as well as all available emergency responders in the Twin Cities area. There are an unknown number of fatalities and injuries. Estimates are that there were 50 vehicles on the bridge and 20 construction workers. Local cell phone service and bandwidth is being overwhelmed and those in the region are being asked not to use their cell phones to allow for emergency responders to use those frequencies. Severe weather is about to move through the area that will temporarily hamper rescue efforts. Correction--just heard that responders are involved in "Recovery efforts" in the river, not "Rescue efforts" at this point. Our prayers are with all involved here. We also pray that we don't see any other similar or follow-up events here or elsewhere that would indicate this is anything other than an accident. 8pm update: Construction-failure investigative expert Tim Galarnik declares he has been made aware that there were fatigue fractures detected last year in the steel support under the superstructure during maintenance inspections. If you're not already aware of the Global Incident Map at www.globalincidentmap.com, you are now. It's a public resource that actually many agencies out there utilize in their official activities. The site offers real-time, graphic mapping and info-summaries of terror and other related events around the world.